Agriculture and Climate Change — KBS researchers were the first to develop a full accounting of the global warming impacts of different cropping practices and discovered novel opportunities for greenhouse gas mitigation by agriculture. These findings inform agricultural greenhouse gas policies worldwide. Agriculture globally is responsible for ~14% of the greenhouse gases that cause global warming – about the same proportion as transportation. 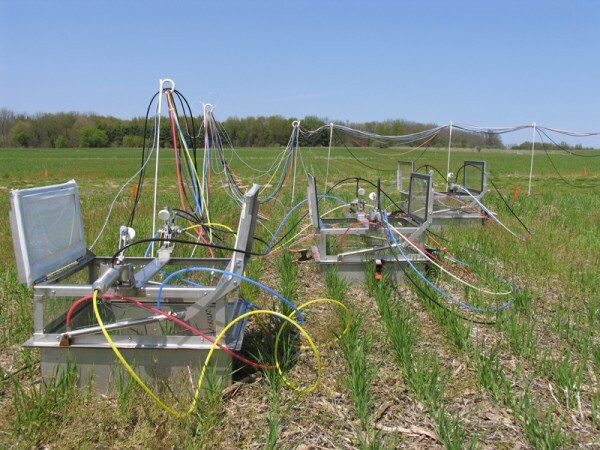 Since 1992 scientists at the KBS LTER site have studied fluxes of the major, naturally occurring greenhouse gases (GHGs)—carbon dioxide (CO2), methane, and nitrous oxide (N2O)—in the cropped and natural ecosystems of the Main Cropping System Experiment. These data, together with concurrent measurements of soil carbon and fuel and agrochemical use, allow the global warming impact (GWI) of each cropping system to be calculated. The GWI is the degree to which an ecosystem contributes to climate warming (a positive GWI value, indicating more GHGs being emitted than captured) or to mitigating climate warming (a negative GWI, indicating more GHGs being captured). Research at KBS (Robertson et al. 2000, Gelfand et al. 2013, Gelfand and Robertson 2015) has shown how conventional agriculture, typically positive, can be made neutral or even negative. The analysis also identifies how individual cropping practices within each system contribute to the system’s GWI. Conventional cropping methods, for example, have an average annual GWI of about 82 CO2-equivalents per square meter. This positive GWI indicates a net emission of GHGs. Nitrous oxide production alone accounts for more than half of this impact—more than the combined impact from fuel use and agrochemical inputs, including commercial fertilizer, agricultural lime, and pesticides. KBS LTER researchers further found nitrous oxide emissionsto increase exponentially with nitrogen fertilization (McSwiney and Robertson 2005, Hoben et al. 2011), a pattern now confirmed globally (Shcherbak et al. 2014), and scientists continue to examine best practices for fertilization to reduce GHG emissions without affecting crop yield. Different cropping practices can reduce GWI markedly. For example, no-till cultivation has an annual GWI that is negative, or net-mitigating. When left untilled, soil organic matter increases and this carbon storage offsets the GWI from related fuel and agrochemical use. Organic farming methods have an even greater mitigation potential—mainly due to soil carbon storage from the long-term use of cover crops such as red clover, which also reduces the need for nitrogen fertilizer and agricultural lime and therefore avoids their GWI cost. Adoption of such agronomic practices could help mitigate GHG production in general—sufficient to offset the U.S. annual increase in GWI from the emission of fossil fuel CO2, when extrapolated to farms nationally. The net global warming impact (GWI) of cropped and unmanaged ecosystems at the KBS LTER site. Row crops include corn, soybean, and wheat rotations. Unmanaged ecosystems include fields abandoned from agriculture 20 (Early) to 60 (Mid) years ago that are undergoing natural succession toward native deciduous forest (Late). Source: Gelfand et al. 2013, based on an update of data in Robertson et al. 2000. Comparison of cropland and natural communities at KBS further show that land abandoned from agriculture for 20 years has a higher mitigation potential (a more negative GWI) than any of the other systems, even greater than mature deciduous forest. Converting marginal cropland into conservation easements with perennial vegetation that could be harvested could thus be an additional strategy for mitigating GHG production elsewhere in the economy and, as Gelfand et al. (2013), especially if the biomass produced is used as biofuels to offset fossil fuel use. Long-term observations are needed to reveal and quantify GWI trends in cropping systems. Many ecosystem processes change slowly. Changes in soil carbon over less than a decade, for example, are very difficult to detect. Other processes are affected by year-to-year climatic variability, making short-term predictions of annual GHG fluxes uncertain. The GWI analysis of these ecosystems was not anticipated when KBS LTER measurements were first initiated. But an ecosystems approach to taking measurements and a commitment to long-term sampling meant that when crucial measurements were needed they were available. The KBS LTER database has proven to be an invaluable resource for revealing long-term trends. Robertson, G. P. 2014. Soil greenhouse gas emissions and their mitigation. Pages 185-196 in N. Van Alfen, editor. Encyclopedia of Agriculture and Food Systems. Elsevier, San Diego, California, USA. Robertson, G. P., E. A. Paul and R. R. Harwood. 2000. Greenhouse gases in intensive agriculture: Contributions of individual gases to the radiative forcing of the atmosphere. Science289: 1922-1925. Millar, N., G. P. Robertson, P. R. Grace, R. J. Gehl, and J. P. Hoben. 2010. Nitrogen fertilizer management for nitrous oxide (N2O) mitigation in intensive corn (Maize) production: An emissions reduction protocol for US Midwest agriculture.Mitigation and Adaptation of Strategies for Global Change15:185-204. Robertson, G. P., S. K. Hamilton, W. J. Parton, and S. J. Del Grosso. 2011. The biogeochemistry of bioenergy landscapes: Carbon, nitrogen, and water considerations. Ecological Applications21:1055-1067. Gelfand, I. and G. P. Robertson. 2015. Mitigation of greenhouse gas emissions from cropping systems. InS. K. Hamilton, J. E. Doll, and G. P. Robertson, editors. The ecology of agricultural landscapes: long-term research on the path to sustainability. Oxford University Press, New York, New York, USA. Gelfand, I., R. Sahajpal, X. Zhang, C. R. Izaurralde, K. L. Gross, and G. P. Robertson. 2013. Sustainable bioenergy production from marginal lands in the US Midwest. Nature 493:514-517. Hoben, J. P., R. J. Gehl, N. Millar, P. R. Grace, and G. P. Robertson. 2011. Nonlinear nitrous oxide (N2O) response to nitrogen fertilizer in on-farm corn crops of the US Midwest. Global Change Biology 17:1140–1152. McSwiney, C. P. and G. P. Robertson. 2005. Nonlinear response of N2O flux to incremental fertilizer addition in a continuous maize (Zea mays sp.) cropping system. Global Change Biology 11:1712-1719. Shcherbak, I., N. Millar, and G. P. Robertson. 2014. Global metaanalysis of the nonlinear response of soil nitrous oxide (N2O) emissions to fertilizer nitrogen. Proceedings of the National Academy of Sciences USA 111:9199-9204.